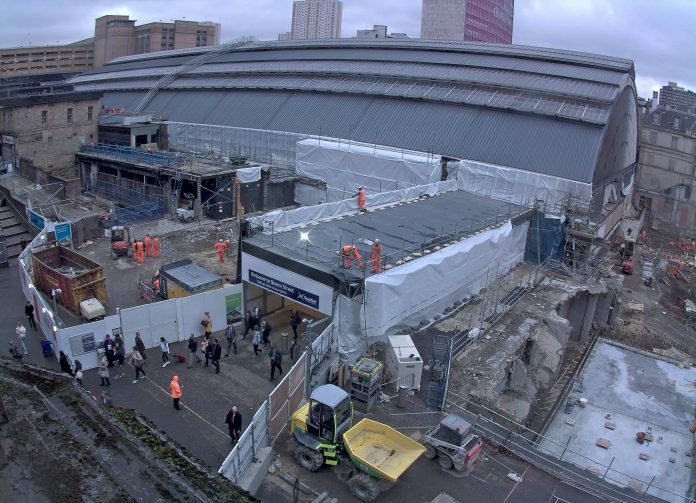 Work to redevelop Glasgow Queen Street station has reached a major milestone with the necessary demolition work now complete. Since January, the demolition team has worked more than 26,000 hours to remove more than 14,000 tonnes of redundant material from the station site – the equivalent of 700 skips. With 94 per cent of demolition material now recycled, it is being given a new lease of life, becoming new products such as aggregate for the construction trade or wood chippings for equestrian centres. Once completed in 2020, the redeveloped Glasgow Queen Street station, which is being delivered as part of the Edinburgh-Glasgow Improvement Programme, will provide extended platforms for longer trains of up to eight carriages and an expanded concourse with more circulation space. Watch the timelapse video below to see the demolition of the eight-storey Consort House building, Consort House annex and the Millennium Hotel’s 1970’s extension of Glasgow Queen Street station. Some good progress happening at Glasgow Queen Street as part of its upgrade.